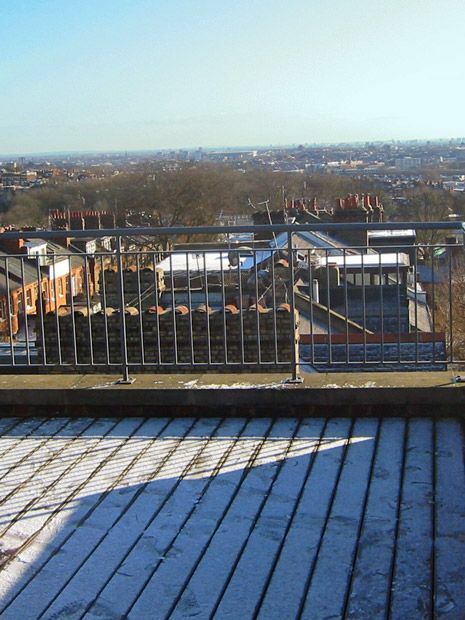 We designed and built this Hampstead rooftop terrace a while back, and I returned to site to meet up with our clients, check on overall progress, absorb the views and enjoy some insights. 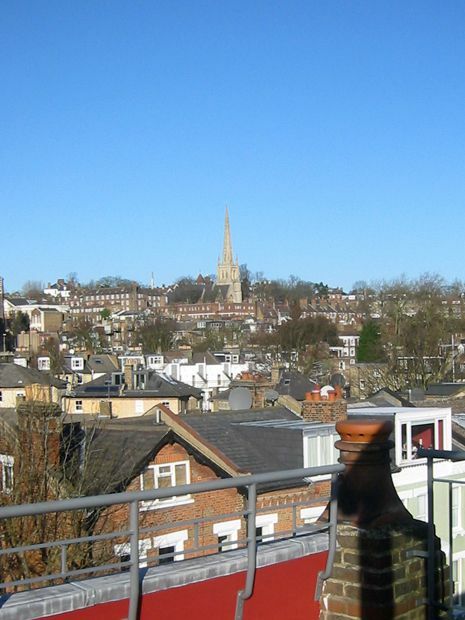 Based in North London, we develop countless gardens and roof terraces in the area, throughout Belsize Park, Highgate, Camden Town, Primrose Hill and St John's Wood, although this location in the heart of Hampstead Village is undoubtedly unique. 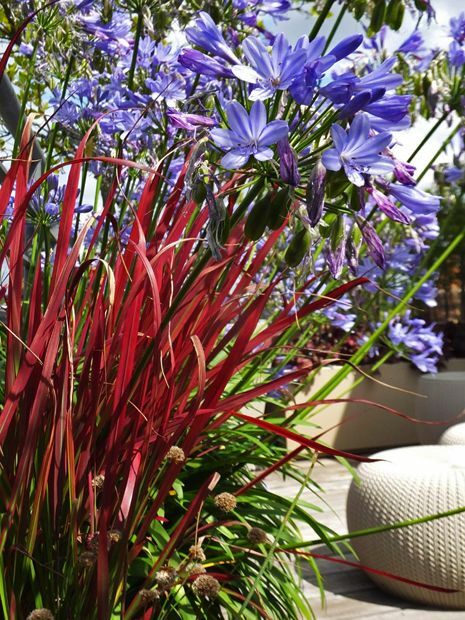 The compact, intimate roof terrace surrounds a contemporary glass structure amid a 360-degree panorama, where an eclectic ambience is discernible in the contrasting nature of the landscape and the owners' love of art and growing Agapanthus! 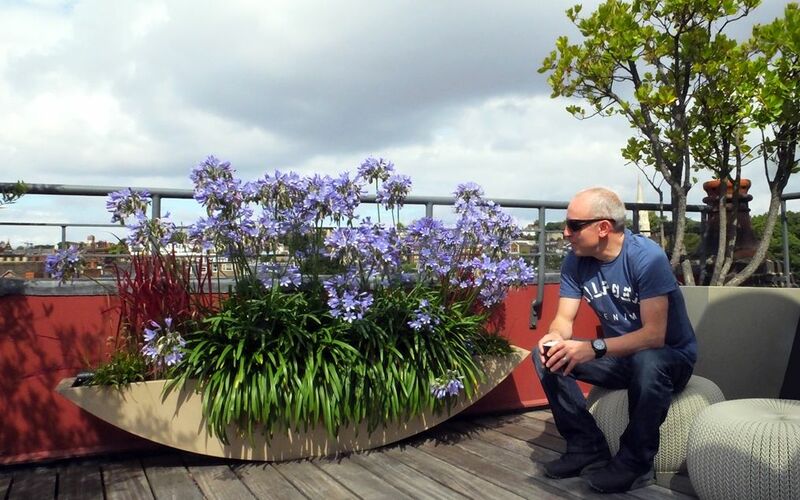 I haven't been on site for nearly a decade, and while I noticed the silhouettes of our Strawberry and Pine trees from street level, the first sight which truly caught my eye, when up on the roof, was an exuberant clump of blue African lilies. I couldn't remember planting it, so I asked Derek: “Weren't these originally Chilean bromeliads?” DE: “Spiky things, not easy to maintain around even with gloves!” AS: “I hear you, they're arid plants. 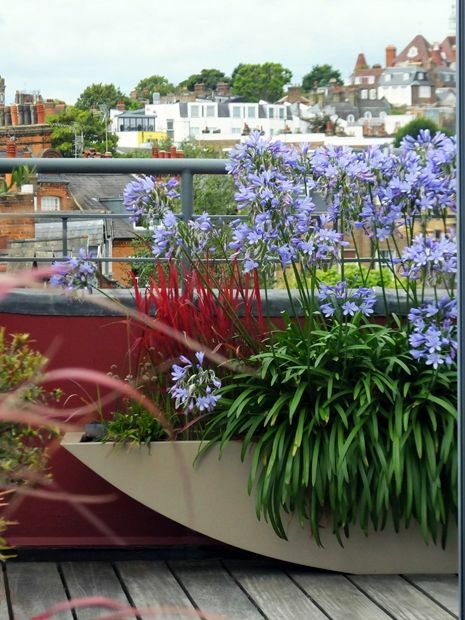 It's warm and fairly breezy up here – I thought they'll fit in usefully, given their adaptability.” Derek's daring combination of blue Agapanthus ‘Amourette’ and red Japanese Cogon grass, Imperata cylindrica, is far daintier, and blends beautifully into the red walls and Hampstead village rooftops, remaining evergreen – the visit is turning out to be an inspiring perspective! We include diverse Pine trees when conditions are optimal, and rooftop garden projects present such ideal environments, where these resilient, sculptural species thrive in strong sun, thermal heat, high altitude and powerful wind. The Scots pine's natural outline enhances the expansive city vistas across this roof terrace, when on clear days, London's distinctive architectural skyline glistens above Hampstead Village. 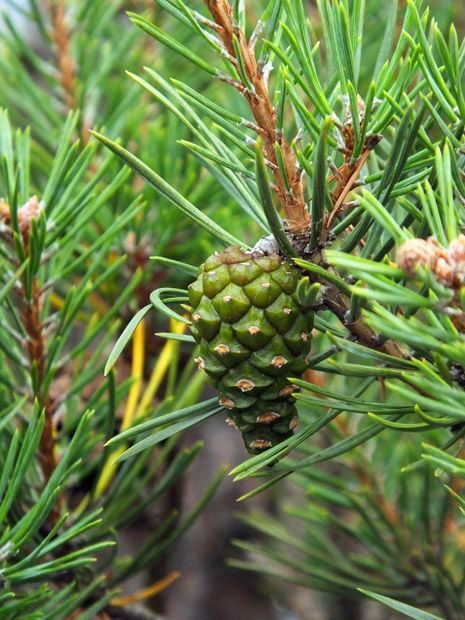 Pinus sylvestris is one of three Pine species native to the UK, and as both Derek and his wife Pamela hail from Scotland, such a specimen is a fitting inclusion. Graceful, slow-growing and unfussy, the tree was in full cone mode when I visited, displaying captivating combos of juvenile and mature strobili. 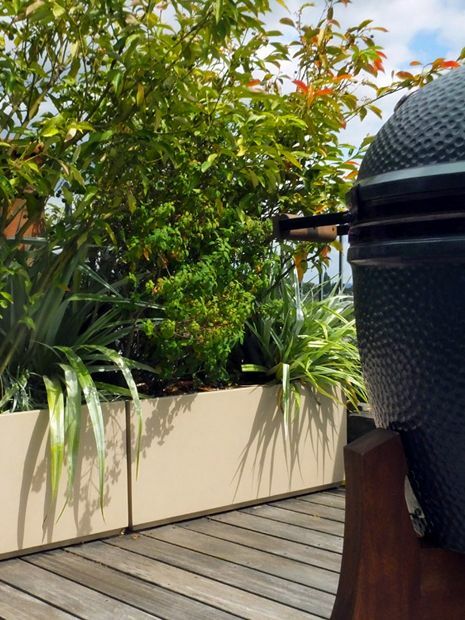 When I saw the open cook book beside a bouquet of African lilies on the way up to the roof terrace, I knew the outdoor space we crafted is getting plenty of use. The Red mullet roasted on the new barbecue had left a wonderful aroma, in keeping with the Mediterranean flora and Hampstead village's distinct ambience. Since I last met Derek, I've become a vegan, yet, no matter what's cooking up on the roof, it's a terrace experience like no other. While the home's kitchen is located two floors below, the layout enables more restful time to spend in this intimate roof terrace of scents, sounds and energising vistas. The first time I arrived here, it was February and snowing; the rising sunbeams highlighted eclectic, inspiring views in every vantage point. The space felt somewhat exposed amid a myriad of rooftops, halfway between Hampstead Heath and Belsize Park. It's a unique elevation, set among the distinctive topography of this historic and picturesque part of London, stretching from Highgate, through Kenwood House via Hampstead Village. It was a blank canvas, except for a deck which was to be removed. The house has a charm, and its owners clearly love this place. Amid an open aspect, and 30 square metres to work with, we'll enjoy developing roof terrace ideas for this space. Access, however, was less than favourable, as you might expect! Hampstead Village is certainly one of the most eclectic streetscapes in London; it's a thriving scene, set within breathtaking views and a contemporary lifestyle – deeply rooted in historical essence. Located within a Camden conservation area, there's much preserved charm here, and no tall buildings. London clients relocate frequently due to continual work commitments, a growing family, or merely needing a bigger home. 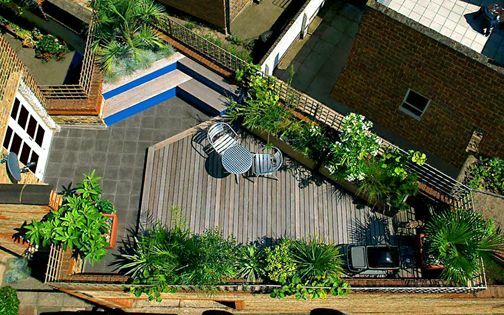 Having created numerous North London gardens, for us, working on a roof terrace was a breath of fresh air. When I asked my clients how is it they're still living here after so long, they replied they've no plans to move from this enchanting Hampstead milieu. 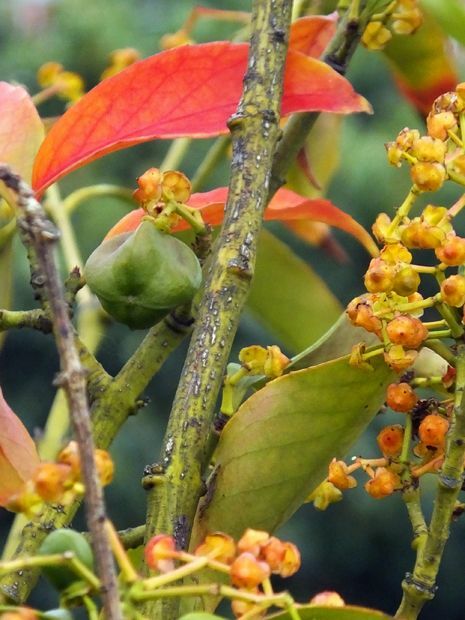 We love planting Euonymus, the native Spindle tree; its autumnal scarlet spectrum, remarkable berries and easygoing essence are truly precious. To conceal the chimney pots, we sought an evergreen shrub, and there aren't many small, all-year-round plants which achieve this task as elegantly as Euonymus wilsonii. 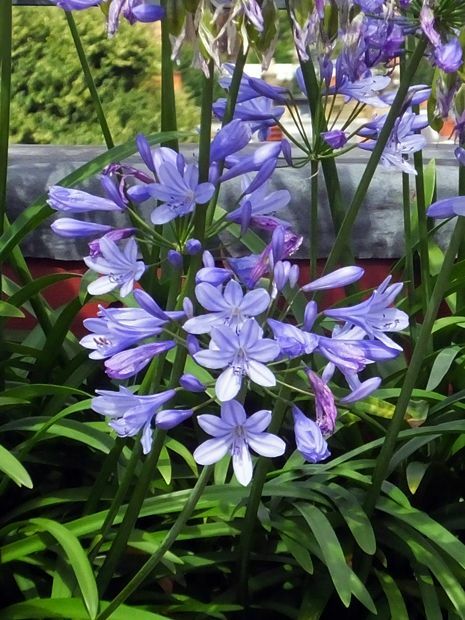 Collected in Western China in 1904 by the plant explorer Ernest Wilson, this resilient species is rare in cultivation, forming a valuable addition to the terrace's flora. Birds adore the unusual Euonymus berries, and make this rooftop terrace, with its abundant wildlife sources, a regular sunrise stopover. 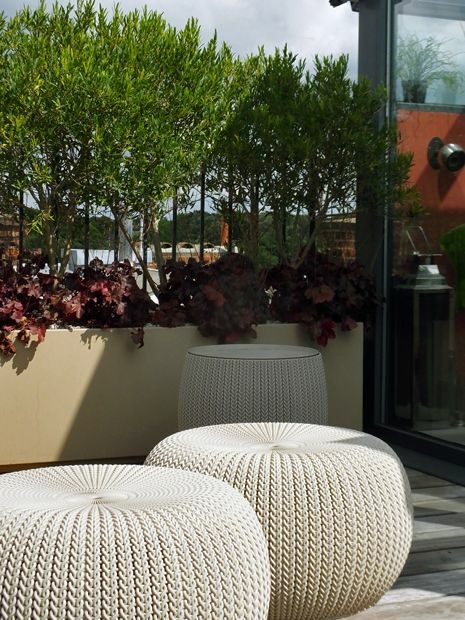 We design bespoke planters for every client and project, and for this rooftop terrace, we sought to contrast linearity with curvilinear forms shaped into low planting vases. We modified an earlier prototype, and enhanced its features by utilising wider folds on the end rims, while increasing length to two metres. In reducing the depth, and creating more height, further space is allocated for social use. 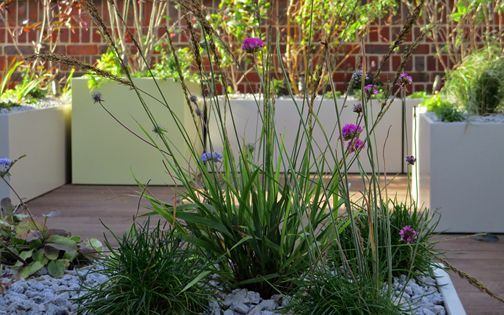 In such a small terrace, the length of these planters increases sense of depth, and provides an ample growing medium for plants. The vases' light taupe colour distinctly contrasts the deep red walls, foliage and petals. 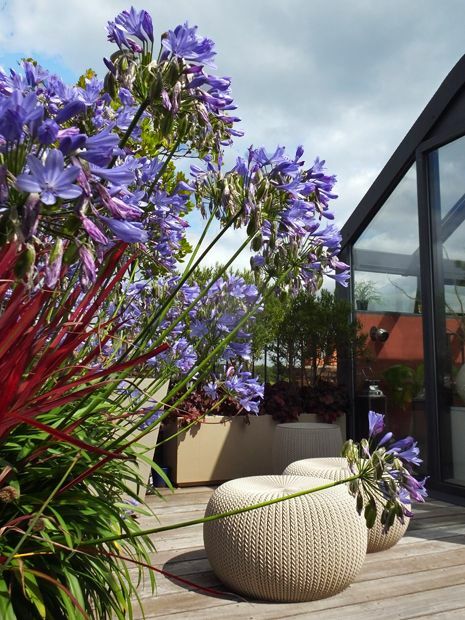 There was no furniture here when we completed the roof terrace makeover project, and the new pouffe set adds much comfort and curves, creating a mellow hub by the Agapanthus. 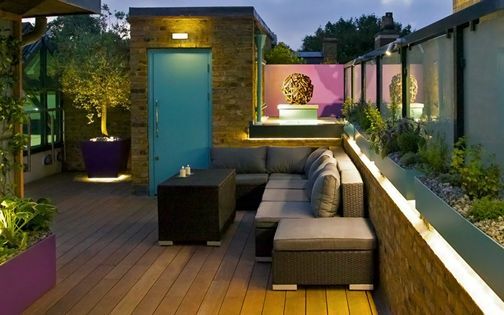 This chic rooftop lounge is facing Hampstead village, amid copious sunshine and a wonderful expanse of sky. 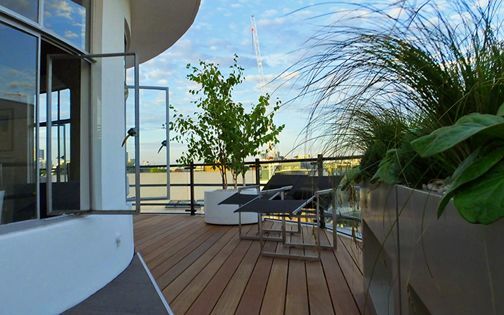 The beige seats blend into the deck and planters, enhancing the space with delicate textures and a dash of on-trend rooftop accentuation. Our clients have certainly infused further character by including these cosy, circular hassocks from which to relish peaceful Hampstead vistas. 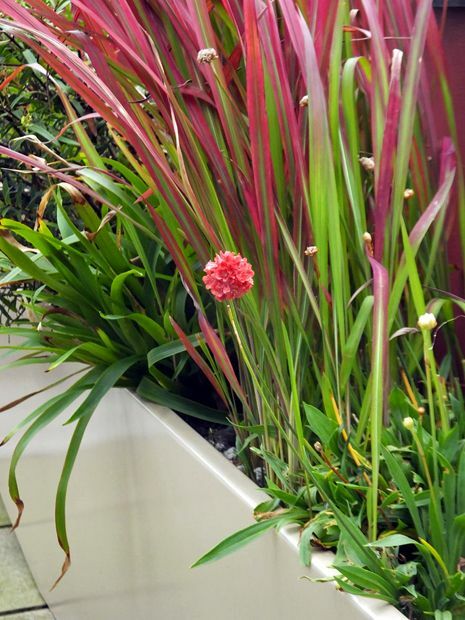 Planting design evolves over time, and by removing the original half-dozen Bromeliads, our clients layered maritime textures and colours into the scheme. Armeria, the native Sea pink, defines a refreshing addition, producing dainty textures below the grasses, and providing a long flowering season. 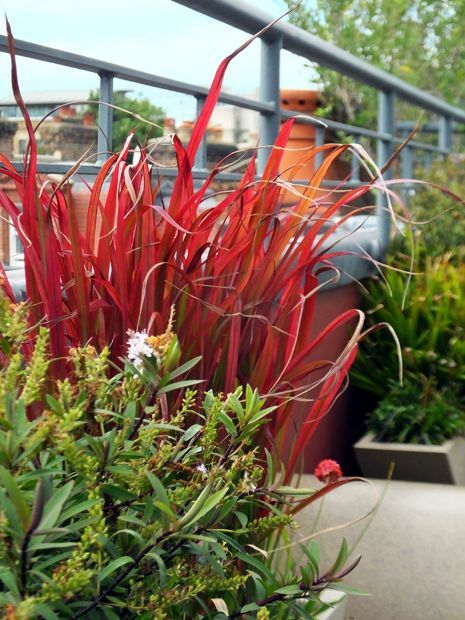 Thriving in constant breeze, these colourful coastal gems energise the rooftop and sync with the red walls. Local wildlife appreciates this plant too – every bit of it, in this dense, terraced environment – above Hampstead's urban treeline. 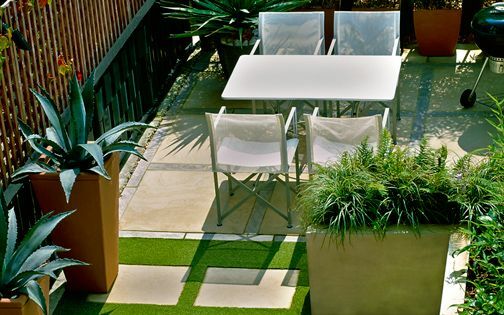 We cherish revisiting previous landscape roof terrace designs to document progress and take photographs, while at times, we need to amend unforeseen dilemmas. Whatever the reason for a follow up, it's an edifying experience – a one which each time exceeds expectations. 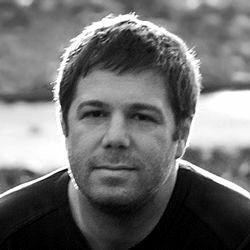 More insight was achieved in an afternoon, under a balmy Hampstead sky, than in countless days in front of a drawing table. 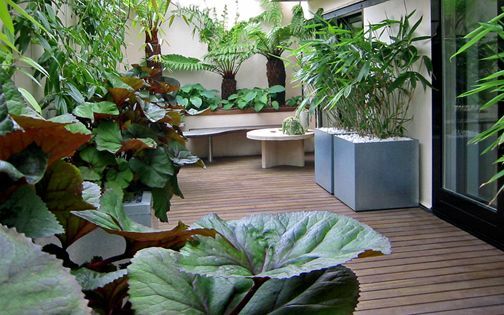 This hands-on approach is also beneficial for the clients, as our informative input in subsequent years accomplishes an effortless terrace mindset – a one of attention to detail, in expressing immersive roof garden designs.